Portland Timbers mascot Joey Webber visits a lot of schools. But becoming a reading coach in The Shadow Project’s schools has proved life changing. 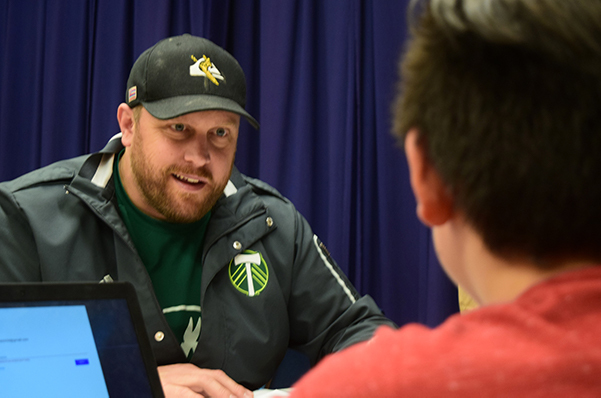 Timber Joey volunteers with Shadow kids one- to two-times a week, meeting with students in special education to talk about books and set reading goals, download audiobooks, and practice reading aloud. Setting goals with kids is motivating, says Joey. “With a goal, you always have something to think about, and motivate you to go beyond if you’re needing more time or practice to achieve your goal. Click here to find out why Timber Joey reads to his dogs!